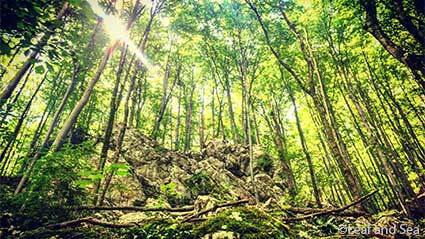 “Albania is dan­ger­ous!” Unfor­tu­nately, we have heard this more often than we would have liked to. At the begin­ning of Novem­ber 2018 we learned that Albania is not dan­ger­ous at all. 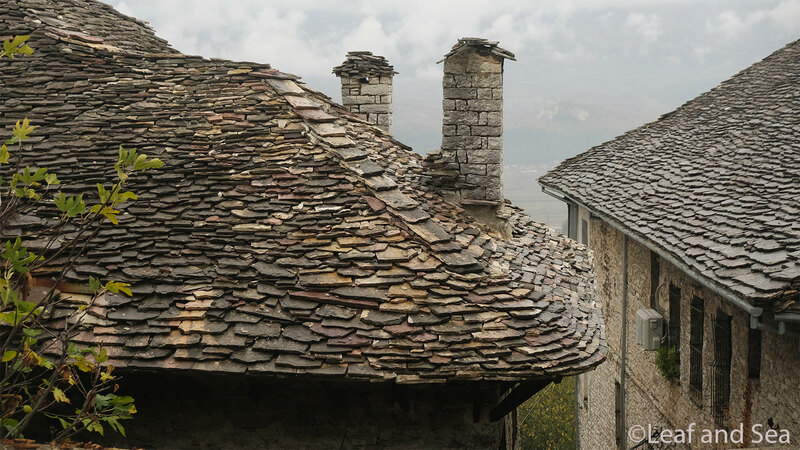 For one week we hitch­hiked through Albania towards Greece. 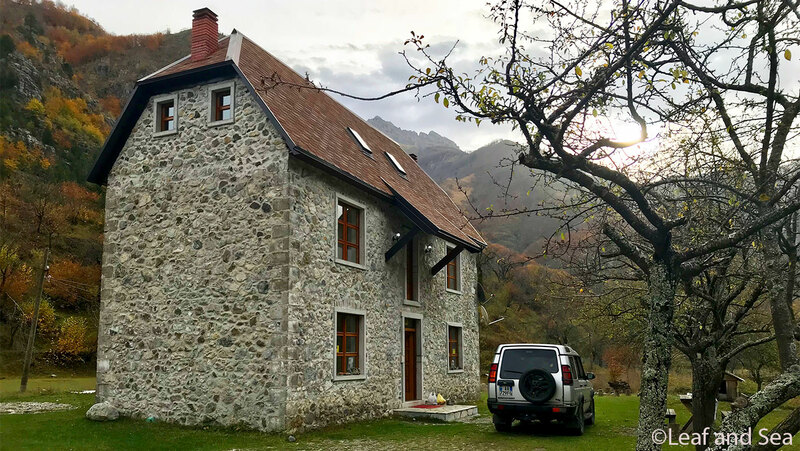 Read here stor­ies about our trips through the Albani­an Alps and a wet­land rich in birds and about encoun­ters with a suc­cess­ful archi­tect and a Mafia mem­ber. 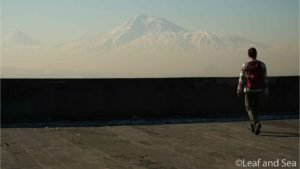 On Novem­ber 1st we star­ted our jour­ney with pos­it­ive energy, full of anti­cip­a­tion and respect — Respect mainly because we saw dur­ing our bike tour through Albania either old bangers full to burst­ing or showy lux­ury cars. But as it turned out, our sense of fore­bod­ing was not jus­ti­fied. We didn’t have to wait long for our first ride: a Ger­man couple who are on hol­i­day in Ulcinj. On the way to Shkoder we talk about their daugh­ters and their exper­i­ences in an Afric­an coun­try. 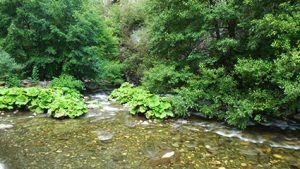 From Shkoder city cen­ter we walk towards the end of the city, where we waited under a roof to pro­tect ourselves from the rain. Two women, also Ger­mans, stop for us. 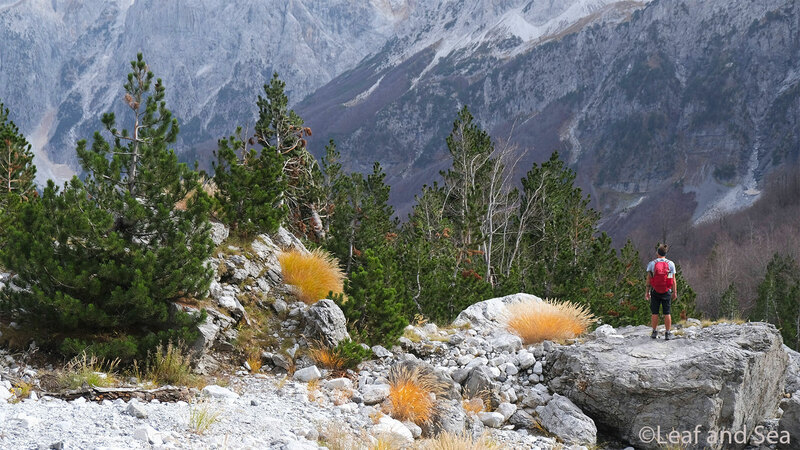 Their des­tin­a­tion: the Albani­an Alps. Great, that’s where we want to go! Togeth­er we drove through a long val­ley, passing a pris­on, always in the dir­ec­tion of the moun­tains in the sky. The last kilo­met­ers we are wind­ing up the moun­tain. At a small café we get off. It rains, but we are allowed to stay at the café. Every 15 to 20 minutes a car drives by. Then one of us jumps up quickly and indic­ates with an out­stretched thumb that we would like to be taken fur­ther uphill. No chance. After the third car we order ourselves a tea and already con­sider to ask how expens­ive a room is in the adjoin­ing gues­t­house. Just when we have fin­ished drink­ing the tea, our sal­va­tion comes: A Landrover stops. We are allowed to hop on! Quickly we stow the back­packs away and off we go. We sit on the back seat. The driver is a sym­path­et­ic Albani­an around 40 named Fred. Next to him is sit­ting his pretty wife Rosa telling us in good Ger­man that we are lucky because the route to Theth was closed in some years already from Novem­ber 1st onwards due to heavy snow­fall. 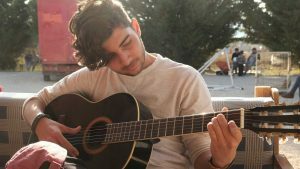 And we have even more luck: the two have a tra­di­tion­al gues­t­house in Theth and an Eco Garden Gues­t­house in Shkoder. They spon­tan­eously invite us to spend the night in their already closed stone house. Of course we agreed. But the road is so bad that we can’t ima­gine that we will arrive alive. The single-lane gravel road is carved into the moun­tain and to our right there is a steep slope down­hill — more than 300 height meters. Guard­rails — no sign of them at all! How nice that oppos­ing traffic also wants to pass by! The driv­ing skills of Fred, how­ever, are very good, and so we arrive well in our accom­mod­a­tion for tonight. 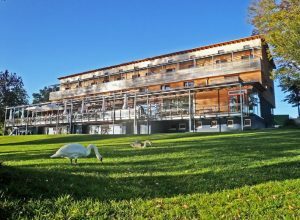 While we helped pre­par­ing an incred­ibly lav­ish din­ner, we learned that Rosa grow up here and that we are allowed to stay overnight in the first tour­ist accom­mod­a­tion in Theth. Rosa even stud­ied tour­ism and helped to build up the tour­ism industry and the net­work of hik­ing trails here. Detailed maps on the wooden walls bear wit­ness to this. With well filled stom­aches and with inter­est­ing stor­ies we lie down in our cozy bed. What a Ger­man day! Nev­er­the­less we are not home­sick. The next morn­ing we have anoth­er prop­er moun­tain break­fast. 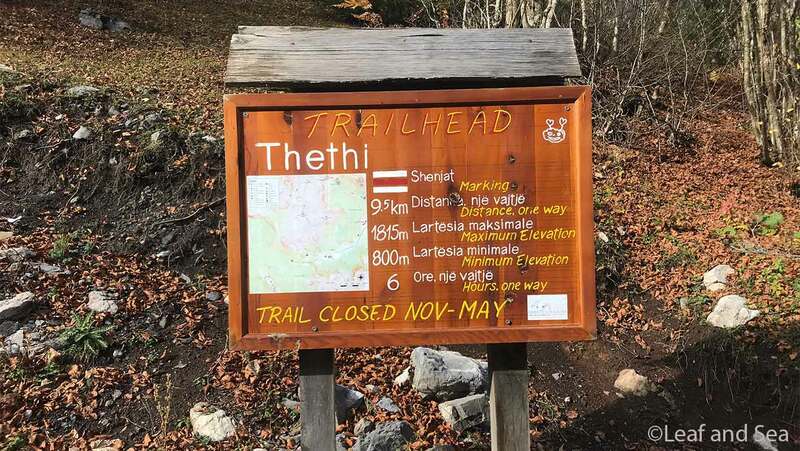 Full of energy and without clouds in the sky we set off for the hik­ing trail from Theth to Val­bona (cross­ing two of the 16 nation­al parks in Albania). 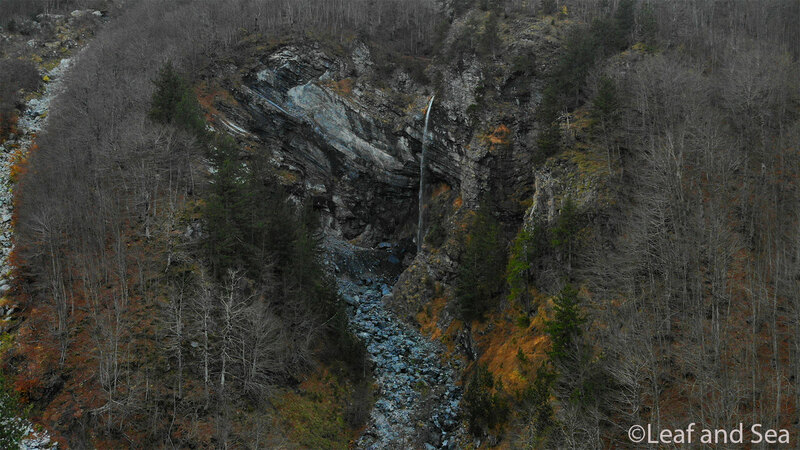 Great views and a beau­ti­ful nature awaited us. The approx. 6-hour walk really inspired us! 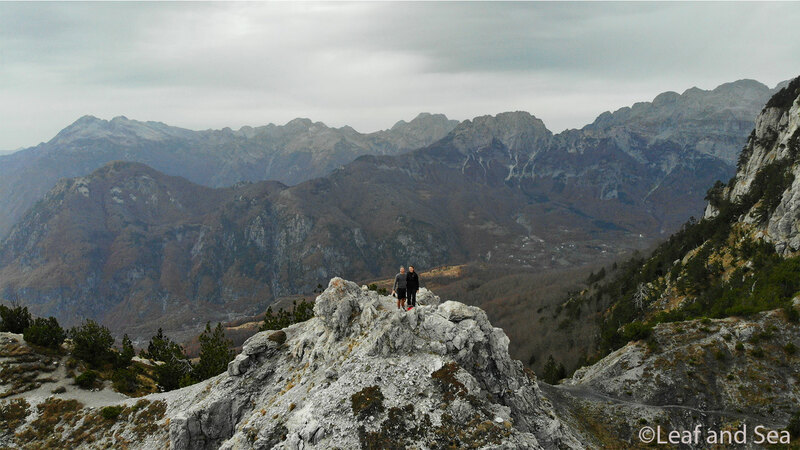 How­ever, we could only enjoy this nature and the hik­ing, because Rosa and Fred took our heavy back­packs with them back to Shkoder. We are very grate­ful to them for this. 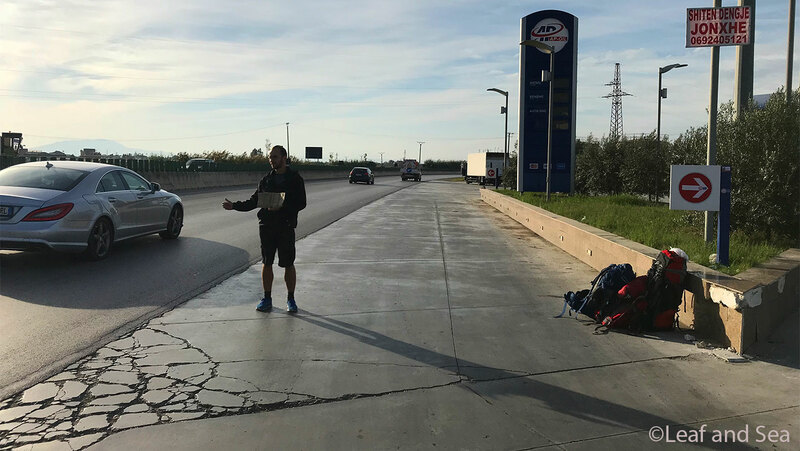 To hitch­hike the route from Val­bona to Shkoder was really not easy. We stayed one night in a hotel in Bajram Curri. As we didn’t get the ferry in Fierza early in the morn­ing, we hitch­hiked over an extremely quiet road. Prob­ably the only car that drove here with­in a week over the very moun­tain­ous road took us for a few leks (Albani­an cur­rency). Accord­ing to the opin­ion of the loc­al people it would have been bet­ter to take 150 km detour and drive through Kosovo! 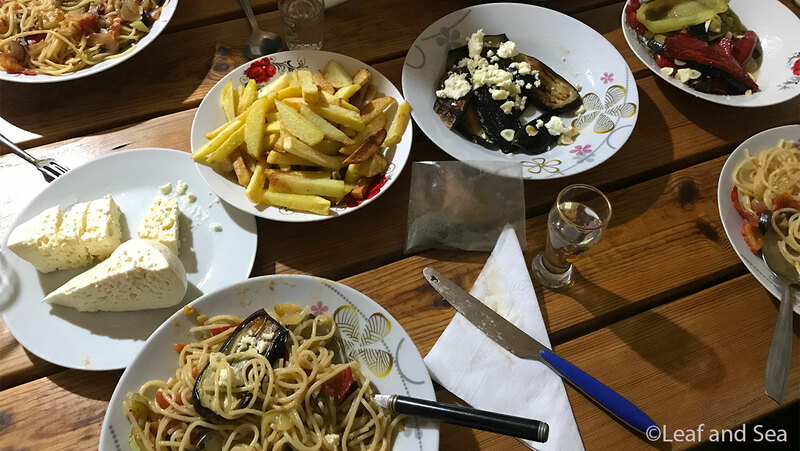 The night in Shkoder in Rosa and Fred’s Eco Garten Guest House is really good for us after the tur­bu­lent drive from Val­bona! The once again opu­lent break­fast strengthens us for the rest of the way. Fred is even so nice and brings us to a good hitch­hike pos­i­tion. After just a few minutes of wait­ing, a nice pen­sion­er takes us with him in his old banger. He speaks well Eng­lish because he had been work­ing as a car­penter in New York for many years. After a ser­i­ous acci­dent at work he is now han­di­capped, but lives as a happy early pen­sion­er in his home coun­try. Not only the cars show that there are great con­trasts between the rich and poor in Albania. Dur­ing our bicycle trip in August I already expressed the wish that I would like to get to know a mem­ber of the Mafia. To also meet some ‘rich’ people. This wish also came true when a black Audi S8 stopped beside us. The “Mafia man” with the golden neck­lace was super sym­path­et­ic. He didn’t use the bul­lets in the box on the back seat against us. Offi­cially, he works in an Itali­an res­taur­ant in Ams­ter­dam. But I didn’t know that until I asked him the third time. Before that, he simply ignored the ques­tion about his pro­fes­sion. We have to smile a bit at the incom­pre­hens­ible story of his car “pur­chase”. He tells us that he bought the car from a UK fam­ily in Romania who had to fly back to Eng­land very quickly. So he could make a fab­ulous bar­gain. In new the S8 costs more than 80,000 Euro — he got it for 3,000 Euro. 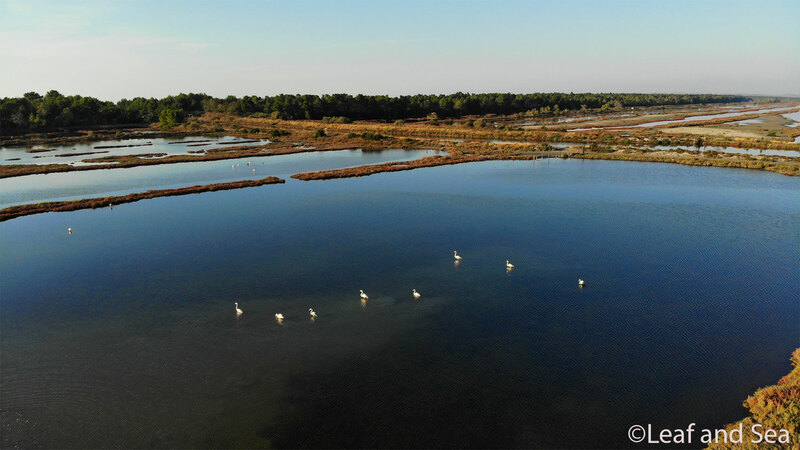 A few days later and more inter­est­ing hitch­hike stor­ies we arrived in the Divjaka-Kara­vas­ta Nation­al Park. Here Enea has agreed to host us for 2 nights via couchsurfing.com. What a coin­cid­ence that he works for the nation­al park and agrees that we can accom­pany him on his work. That’s the amaz­ing video about nation­al park. We are already wait­ing for 30 minutes next to a gas sta­tion. Sud­denly everything hap­pens very fast. A sil­ver Mer­cedes E-Class stops. 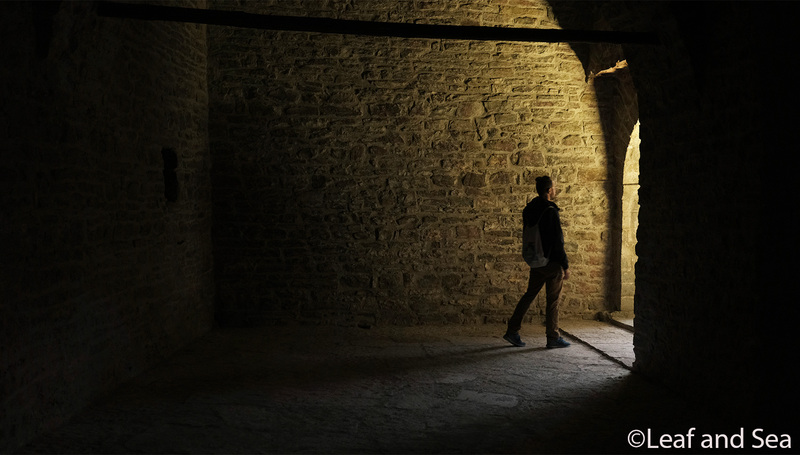 Stef­fen opens the door and asks where he is going. “Fier” is the answer. Per­fect! So we put our heavy and bulky back­packs into the trunk, get in and off we go. I sit in the front. After just one sen­tence it’s clear: Our nice driver doesn’t know any word of Eng­lish. And no Ger­man either. Actu­ally only Albani­an. But he just laughs and tells us that it’s not so import­ant. Only 15 minutes later we already know the fol­low­ing: Our driver is 63 years old, is called Syrja, lives in Tir­ana and has a con­struc­tion com­pany with 30 employ­ees. They build apart­ment blocks in the tour­ist des­tin­a­tion Vlora dir­ectly at the sea. He has three chil­dren: one son, 22, who lives in Istan­bul and two daugh­ters, one 30 and liv­ing in Vienna, the oth­er 30 and in Tir­ana. Syrja calls this daugh­ter so that I can talk to her on the phone. She speaks very well Eng­lish and seems to be very cha­ris­mat­ic like her fath­er. The daugh­ter trans­lates a few sen­tences about our world travel his­tory for him, and as he finds them excit­ing, he spon­tan­eously decides to invite us for a cup of cof­fee. We have nev­er under­stood any­body so well with hands and feet before! On the fur­ther way we stopped again at one of the best Bur­ek-Bis­tros far and wide and get 6 huge veget­ari­an spin­ach-Bur­ek and 2 drinks to take away. We say good­bye to our new friend with many “Fale­mind­er­it” (Albani­an for “thank you”) and a warm hug. 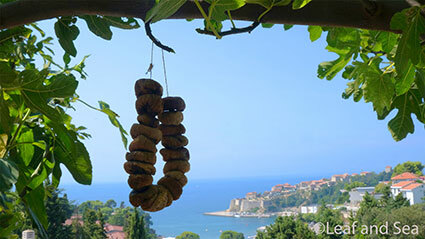 We liked Gjirokas­tra very much from an urb­an point of view. 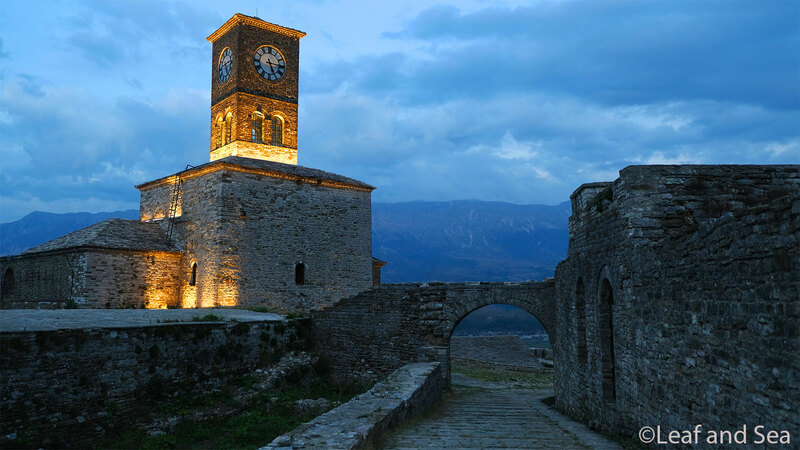 The stone town in the south of Albania deserves the UNESCO World Her­it­age des­ig­na­tion. The stone build­ings blend magic­ally into the sur­round­ing moun­tains of Mali i Gjerë. The bell tower on the castle hill over­looks the town. The castle is home to a weapons museum, which houses many can­nons and oth­er war weapons from the 1st and 2nd World Wars. The view from here is worth the steep climb. 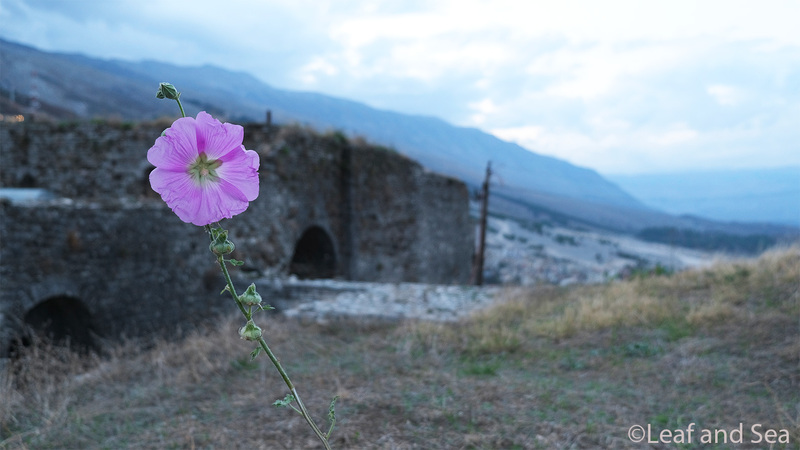 Bats and fal­cons feel at home in the castle ruins like this pic­tur­esque flower. 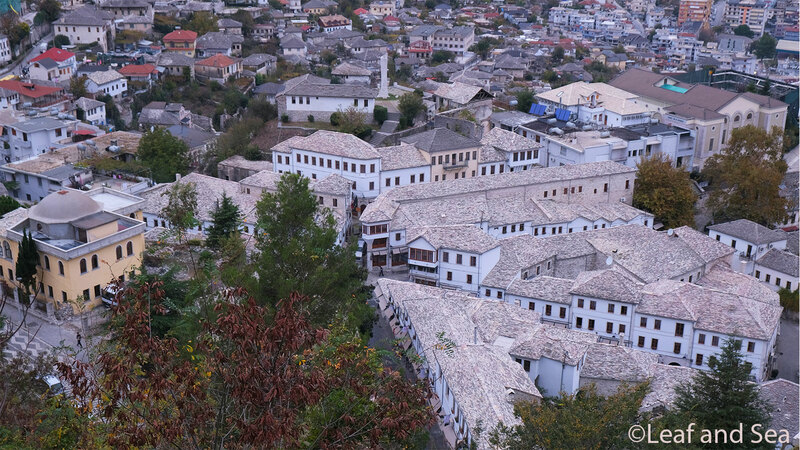 View from the castle to the stone roofs of the old town in Gjirokas­tra. Skil­fully stacked, the roofs are more like an art object. 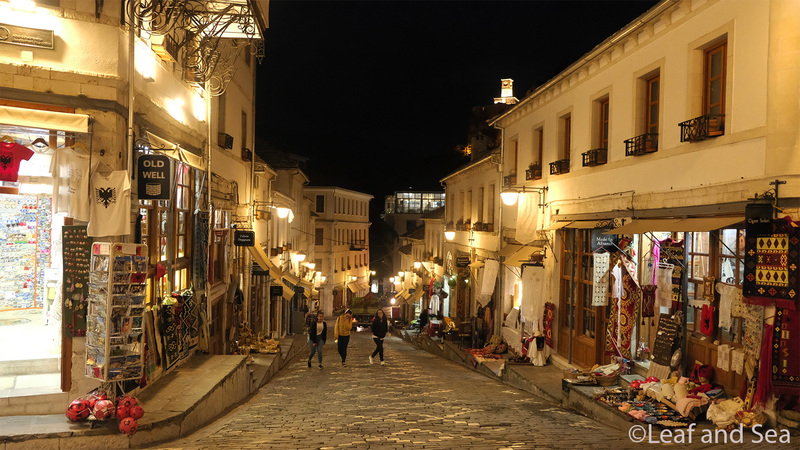 The old town of Gjirokas­tra in the even­ing — souven­ir shops with car­pets, caps and embroid­ery invite you for a stroll. Once again to remem­ber: Albania and dan­ger­ous? Not at all! 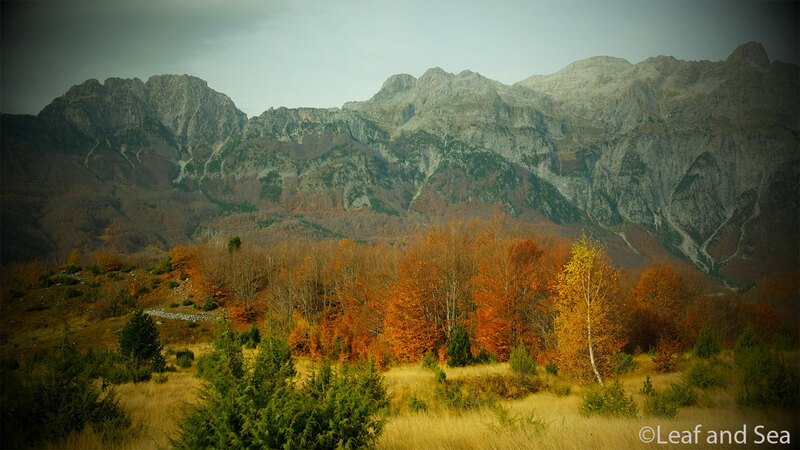 Albania is not more dan­ger­ous for tour­ists than e.g. Ger­many or oth­er European coun­tries. Hitch­hik­ing is well pos­sible here, des­pite some crammed or arrog­ant lux­ury cars. The nation­al parks invite you to mar­vel at them. 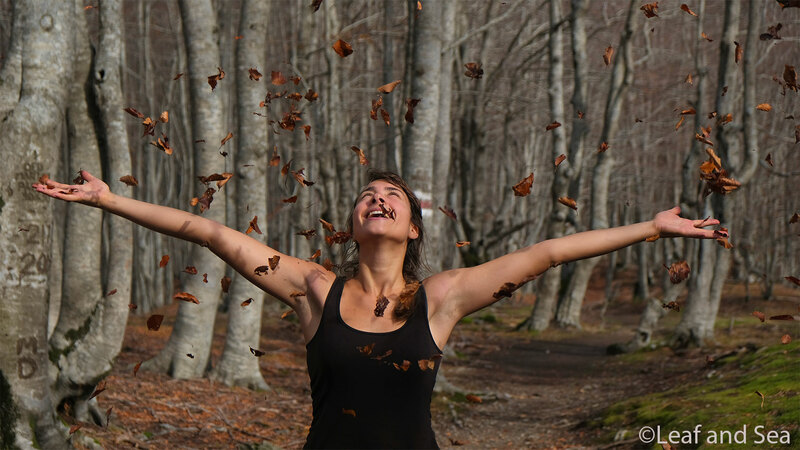 Albania is a beau­ti­ful coun­try with great and help­ful people. 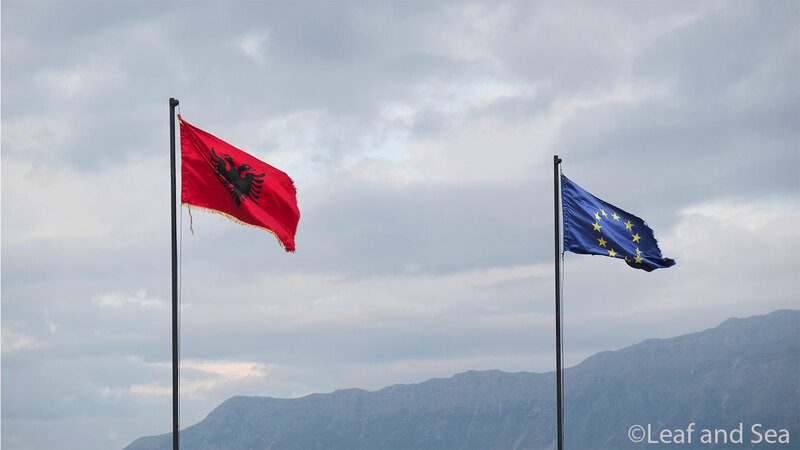 And maybe Albania will be an EU coun­try in the near future. We would be happy about it!